According to a recent study, only a third of people in the San Francisco area actually feel confident when it comes to personal finances. * That’s why Capital One has set out on a mission to empower people to feel confident in their relationship with money by redesigning banking to be more simple and straightforward. At the heart of that journey, the newest Bay Area Capital One Café location at Walnut Creek (1139 S Main Street, Walnut Creek CA 94596) opening later this year. The new Walnut Creek location is Capital One’s second café location joining the Union Square Café (101 Post St, San Francisco, CA 94108). 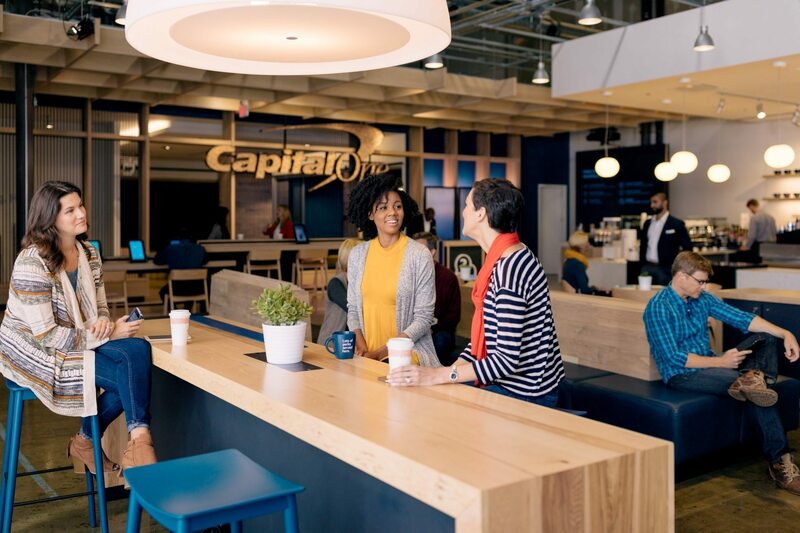 At the intersection of both the digital and physical worlds are Capital One Cafés – a space that’s intentionally designed for how people live and bank today. If you haven’t been to a Capital One Café, we highly recommend it. It’s not your typical banking experience; it’s a space that’s warm, welcoming and highly interactive. When you walk in, you are greeted by Café Ambassadors sporting apparel curated by former Project Runway contestant Shirin Askari. These Ambassadors order coffee for guests using an Apple iWatch and then take them to sit on a comfortable sofa (not behind a desk) to help coach them through setting up an account, paying their bills online, applying for a credit card and more. It doesn’t stop there. When you visit a Capital One Café you can learn new digital tools through an interactive Demo Bar – like exploring an app that helps keep your budget in check to how to manage your account using just your voice through a first-of-its-kind skill with Amazon Alexa. You can even challenge your financial knowledge through Interactive Screens that provide educational money content, deposit or withdrawal in any denomination using Cash-Deposit ATMs or utilize one of several complimentary spaces, like nooks and meeting rooms. To continue helping San Francisco residents think about their bottom line in new ways, Capital One is heading to the Bay Area for its second stop on its ten-city Banking ReimaginedSM Tour, taking place at the San Francisco Waterfront, PIER 39 this weekend! For more information on the Capital One Banking ReimaginedSM Tour, visit www.capitalone.com/bankingreimagined or tweet @CapitalOneCafe.